I’ll let you in on a secret – I think that Ardbeg is my favourite distillery on Islay. For someone who isn’t a massive fan of peaty whiskies, it offers the perfect level for smoke, alongside fresh, citrusy flavours. It’s also got one of the strongest core ranges in the Scotch whisky industry, formed of the Ardbeg Ten Old Year, Ardbeg Uigeadail and Ardbeg Corryvreckan, which was the most recent whisky to join the range in 2009. But now, eight years later, trio is joined by the new Ardbeg An Oa. 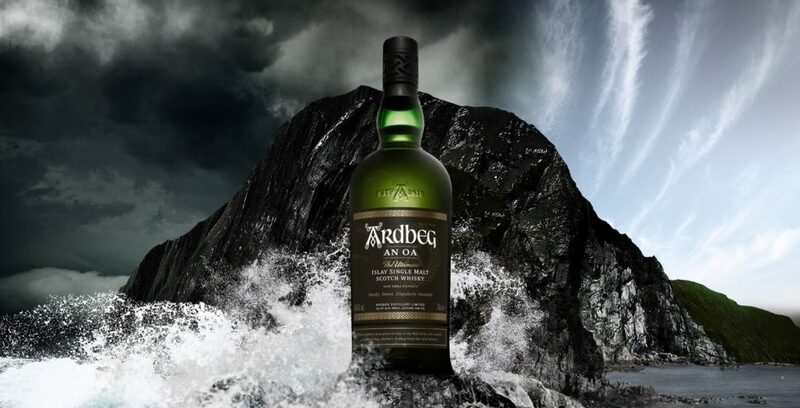 Ardbeg An Oa (pronounced “an oh”) is inspired by Islay’s Mull of Oa. Located at the southernmost point of Islay, the headland’s towering cliffs provide shelter for the island’s south coast, to which Ardbeg has clung to for more than 200 years. Back at the distillery itself, the bespoke Gathering Room houses the vast Gathering Vat, which has been specially created to bring Ardbeg An Oa into being. Here, whiskies from several cask types – including sweet Pedro Ximenez, spicy virgin charred oak, and intense ex-bourbon casks – mingle to create the final flavour. The smoke on the nose is so inviting – nothing too strong, but still tempting me in. There’s a creamy, toffee aroma, with dates and stone fruits, with a zing of lemon. After the glass warmed in my hand for a few minutes, the smell started to remind me of a tearing open a freshly baked sponge cake. The smooth, creamy texture continues on the palate, with lots of sweetness – white chocolate, treacle and steamed pudding. The lime also reminded me slightly of key lime pie. The light smoke is completed by some cinnamon and nutmeg, with a slight matiness. It takes a cracking dram to break into Ardbeg’s core range but An Oa more than deserves its spot. You can find out more about Ardbeg An Oa and the rest of the range at www.ardbeg.com. My sample was provided by Ardbeg.